Bittrex will not be having the highest Volume as the coin is now delisted, that means the coins cannot be traded or stored on there anymore. People will have to decide for themselves where and what they want to do with their coins from Bittrex. The obvious thing to do is not worry about what happened but worry about what you need to do next. The obvious thing most people would want is for the coin to go back up in value. Ask yourselves how can this can be achieved, obviously not panic selling at a low price. Hold onto your coins and put them onto a exchange so that when the price does go up your ready to sell at whatever point you need to break even or take a profit. This will only be achieved if the volume that was on Bittrex moves over to Cryptopia, Think about it. If you put it onto a Wallet it is not exposed to the market so cannot affect it, it needs to be on the Exchange and traded. Being sceptical is a good thing but positive action is needed from the holders of this coin. It looks to me like someone wanted to get as much Uno as possible before the market closed. Support of that theory is that the #1 wallet added nearly 4K of uno after. Where are those stats taken from? Very interesting. I'll have to look into this more and see exactly where they get these numbers from and what determines the accuracy. I,ve come to the conclusion that some of the stupidest people in the world own this coin. Some of the questions and comments i,ve seen people who own this coin is unbelieveable. I realise that a lot of people had left there coins on Bittrex even though they knew the exchange was delisting the coin. One guys comment i saw and everybody else can see on the reddit blog is crazy., he said he just checked is account on Bittrex and its showing 0BTC what the hell did he expect. Most of these coin holders have no idea how Markets work. Markets work on Emotion and Volume and all i,ve seen holders of this coin do is talk it down and say i,l save it in my Wallet. The power of the coin is with the holders of it but seen has none of you believe in it then why are you holding it. I hope Bittrex stops people from accessing their coins, it will teach people a lesson the hard way. Who can give me a sensible reply to my comments. I bet there is not a single person out there who will give me a decent response, shallow minds out there. This is my last comment on this coin and matter. Stupid people get your coins on CRYPTOPIA to create VOLUME and the price will go up its as simple as that Dummies. I grabbed 15 UNO after the crazy hype @ .0101, and moved my tokens to Cryptopia shortly thereafter. Of course some people probably still have their tokens on Bittrex, and they can remain there for another week or so. 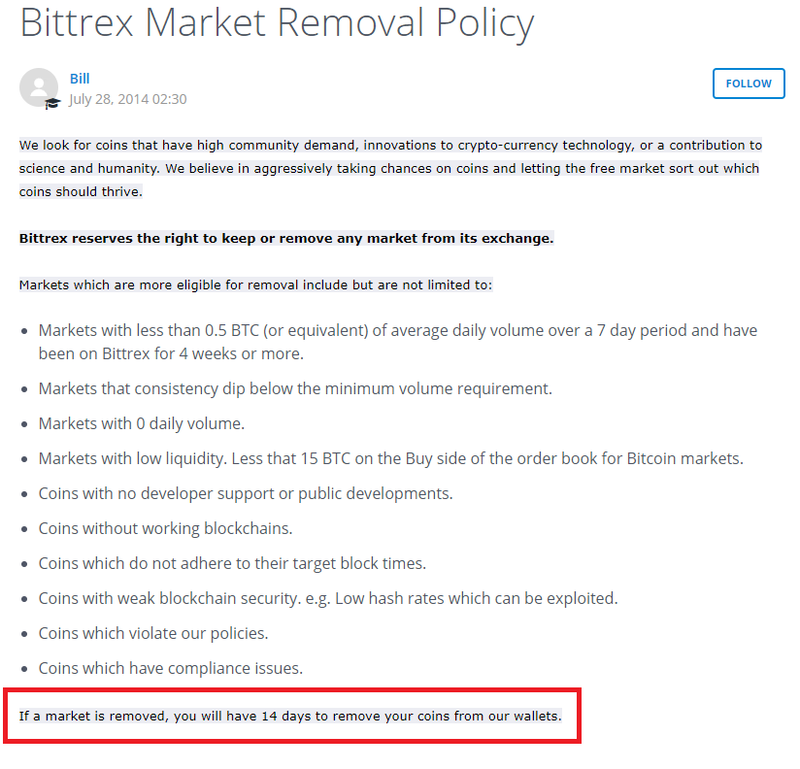 Bittrex allows 2 weeks for people to liquidate before they close the wallets of a delisted coin. Take it easy boy... Idea of crypto itself is not from ancient age, its a new thing so let people make mistakes and learn from it. I know of many BTC wallet that have never been touched from ages and have millions of dollar worth BTC in the wallet. Compare to BTC i know the volume is less still bro no need to be rude. Just see, UNO was removed from Bittrex. Any reason for that? UNO was one of oldest serius coins, deseved to be trade there. Understand, trade volume was not bigest there, but still. Bittrex is serious about volume. If a coin isn't consistently seeing 5+ BTC in trades daily, it will get removed. TOUGH LOVE is my attitude to fellow coinholders, Apologies to anybody who felt offended by my comments but i do believe this coin can make a LOT OF MONEY. Reason why is there was a lot of volume on Bittrex so i don,t fully understand if volume was the reason why they delisted it. I,m a experienced Investor and Trader so i would like to help others understand how the price can move up or doen on these coins on a exchange. A member on here called Thinkless has left a good link above which supports my Opinion on Volume being one of the major factors which affects a coin price. if at least 30% of the volume which was on Bittrex was to move to Cryptopia the price would almost certainly DOUBLE from where it is now. If that was to happen i would suggest that peolpe have their coins on the exchange ready to take advantage of that increase. Then what you do is take out your original Stake and re-invest just the Profit back into the coin and that would leave you in a better position if you wanted to hold onto the coins long-term. If you hold onto the coin in a wallet without trying to trade it from now inevitably the coin will lose value and you will realise what your holding onto is worth nothing long-term so the only way to make this successful for coinholders is to Trade a little and Invest as well. The volume was exceptionally high on two days. One day was a major sell-off (October 10th), which is when Bittrex originally stated they would be delisting Unobtanium due to low volumes. Clearly people saw this as a weakness for the coin, and sold. Shortly after (October 20th), there was a major buy-in. FallingKnife (a rep of the Unobtanium team) claims this was one person buying in for 16,000 tokens; see original post from a week ago above. Of course this link is from Cryptopia's volume, but Bittrex volume wasn't actually much higher, tho it did break 5-BTC a number of times, Bittrex requires 5-BTC a day and consistently missing that is grounds for delisting. Moving on... Simply people moving tokens from Bittrex to Cryptopia wouldn't raise the price or the value of Unobtanium. You need to have movement of funds, with new buyers entering while previous buyers hold; this in effect causes deflation (less supply available for trade) for the buying market and raises prices. The ways we will see an increase is by the Unobtanium team investing time/money in marketing and development. I have not personally seen any sign of this. To be totally honest, this coin seems to have some sort of community over the years, but the activity is not specifically high. The team has also shown no signs that there is much or even ANY development. This is certainly disappointing as I'm sure many people bought in at highs and are suffering substantial losses as the price widdled back down to where it started before the boom on the 20th. kel-alt - OK, now I am an old timer - my miserable Bittrex time: Price dropped to $75 and I buy 10 more UNO. Price drops to $49 and because of Gold fork I decide to go to BTC. Price goes up to $400 - about 3 AM I wake up and check, get up and sell 5 at Cry and try to send 5 to Btrx to arbitrage (first such attempt) $100 price dif. They get there 16 hours later - should have sold at Cry! Dollar wise my largest holding was in UNO and I missed a 650% move! Bought 5 more at $75 again. I made every bad decision I could have made due to de-list and Gold fork combo. I did come to the same above conclusion that there can be profit made with a de-listing. I lost a few hundred, but I will never forget the lost opportunity for massive gain. I doubt this combination of circumstance will ever happen again. Wow, crypto roller coaster on steroids! WHEN UNO IS GOING TO BE UP AGAIN? It is nice to see you here, but also hope to see you on Telegram. The Big Hash miner has moved back on to Unobtanium. The blockchain is being hashed at about 700 PetaHash right now.